Col's Creating Memories: The Sketchy Challenges BLOG HOP! The Sketchy Challenges BLOG HOP! Hello everyone, I am so excited to be apart of The Sketchy Challenges blog hop and to share my sketch with you. I hope you are having fun and enjoying our hop! You should have come from the lovely SABINE'S blog, but if you haven' please have a look here to see the sketch and the start of the blog hop. I have coloured a gorgeous image from Sweetpea stamps, I love to colour hair! The papers are Glitz 'Pretty in Pink', the sentiment is WOJ 'Festive Occasions', Wild Orchid flowers and a doily from my stash. Your next stop is the lovely KARINA. Thank you for joining us in our hop, there are some fabulous prizes so don't forget to have a look here and have a lovely Christmas! What a amazing creation, thats a cool image! Oh Colleen,your card looks really amazing,the colouring is so wonderful and all the details fits perfect together. 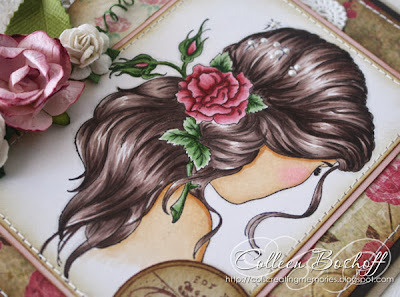 Many thanks for your wonderful sketch and your inspiration and for this great blog hop. Wow! 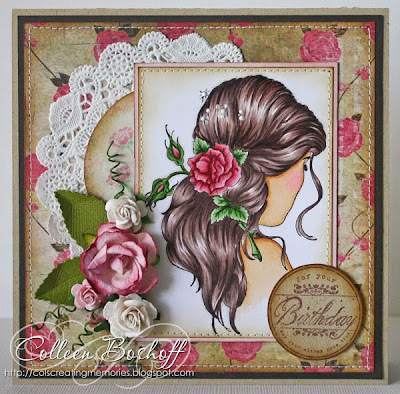 What a stunning card and image Colleen! Beautiful image, and you've coloured her hair beautifully. WOJ's 16 Days of Christmas Stockings!